Why was there such stress on aiming one’s rifle low during Civil War battles? It has to do with weak powder and great bullet weight. The Civil War Springfield rifle fired its ponderous bullet at about 950 feet per second. By contrast, today’s far lighter military bullets zip down range at anywhere from 2,500 to 3,100 feet per second because today’s powders are so much more powerful. In layman’s terms, modern rifles are relatively flat shooting compared to the underpowered Civil War Enfield and Springfield rifles which tossed their bullets in a pronounced arc. But that oversimplifies the case. No rifle is truly flat shooting. Gravity drags a bullet in a downward arc the instant it departs the muzzle. Thus rifle sights – today as in the 1860s — are set so that the barrel actually points above the point of aim. But the trajectory with which light M-16 or AK-47 bullets scorch downrange is flat compared to the looping parabola described by the heavy-weight Minie ball driven by black powder. Thus, Civil War sights were set dramatically higher than today’s M-16 or AK-47. Today’s most common military cartridge. 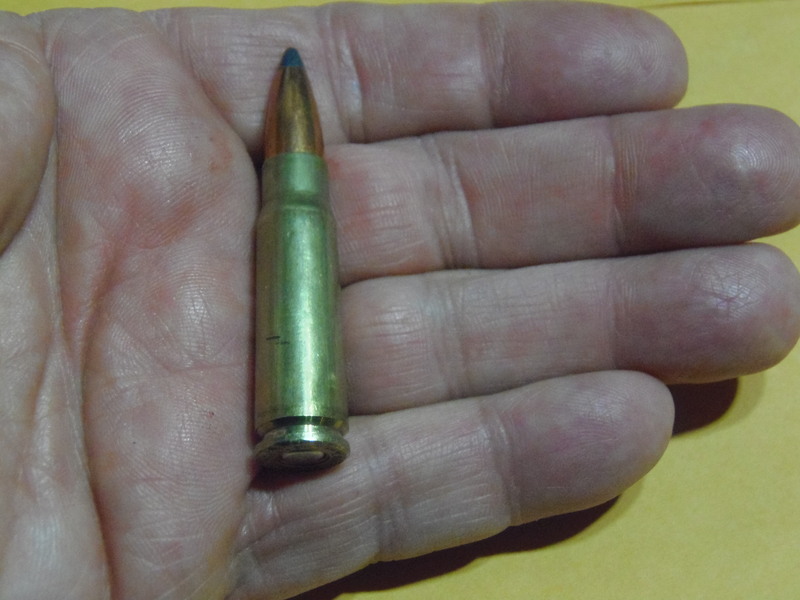 In technical terms, the so-called Minie Ball generally weighed about 500 grains, or 1.1 ounce whereas today’s AK-47 bullet weighs 115 grains, about three-tenths of an ounce, the 50-grain M-16 rifle, one-tenth ounce. The photos show ammunition of the 1860s with its paper cartridge and 60 grains of black powder compared with today’s AK-47 cartridge with, depending up type, 15 to 20 grains of smokeless powder. Let’s clear up confusion that began in the 1830’s. Prior to that, firearms – whether Kentucky/Pennsylvania rifles, or smoothbore Brown Bess muskets, or British Baker rifles or Hawken hunting rifles – all fired a lead sphere, a ball. Loading a smoothbore musket was pretty simple and fairly fast because the ball was smaller than the barrel. But that size disparity dictated that the missile was slow, its range short and accuracy poor. A rifle was far more accurate, but loading it was slow. 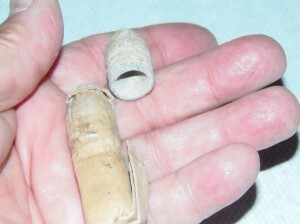 It was necessary to carefully wrap the ball in a heavy leather or cloth patch which made it a tight fit in the barrel. The patch fairly effectively sealed the powder’s expanding gasses behind the ball, imparting greater velocity. The patch also engaged the barrel’s rifling grooves, causing the ball to spin in its flight, giving it much greater accuracy than the wobbly trajectory of a musket ball. Bottom line — smoothbore muskets gave a high rate of inaccurate fire while rifled muskets gave a slow rate of fairly accurate fire. In 1832 a French Army captain, Claude-Etienne Minie (pronounced Meen-yay), perfected a way to combine fast musket loading with rifle accuracy. He developed a lead bullet with a cone-shaped nose and hollow base (see top photo). It was smaller than the rifle’s bore. But when the powder fired, its gasses drove the skirts of the bullet’s hollow base outward to grip the rifling, imparting the spin so important to accuracy. The U.S. Army adopted Minie’s bullet in the 1840s so, for the first time in history, American soldiers were firing a bullet rather than a ball. But Washington persisted in calling Minie’s bullet a ball. To add insult to injury, they also mispronounced his name, calling it a Minny Ball . . . this even after Minie (by then a retired colonel) came to work as a consultant with the Remington Arms Co. before and during the Civil War. So the Minie ball was no ball at all. The bullets sure looked pointed to me, but it’s an unwise recruit who corrects a sergeant, so the nomenclature hangs on.